In addition to the cytoarchitectonic method of creating divisions, the extensive folding of the cerebral cortex also provides a means of identifying distinct regions in the cerebral cortex (Fig. 3). It is this extensive folding that greatly increases the surface area and thus the volume of the cerebral cortex. Although the folds delineate some of the functional areas of the cortex, the borders between the cytoarchitectonic divisions and the major and minor folds do not necessarily correspond. Figure 3 Gyri and sulci on the lateral (top), medial (middle), and inferior (bottom) surfaces of the left cerebral hemisphere. parietal from the occipital lobes. The parietooccipital sulcus starts at the superior surface of the human brain and extends inferiorly along the medial surface until it merges with the calcarine sulcus, which starts at the most posterior part of the cerebral cortex (the occipital pole) and extends anteriorly along the medial surface of the hemisphere until it meets the parietal-occipital sulcus. 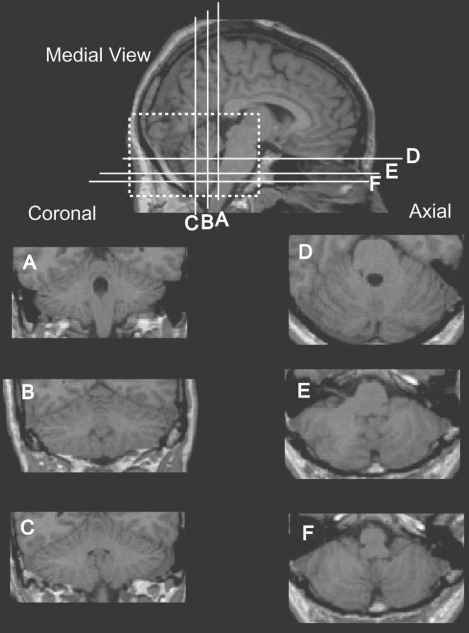 The primary visual cortex is located along the calcarine sulcus. On the lateral surface, the occipital lobe is defined by a line joining the parietal-occipital sulcus and the preoccipital notch. The lateral sulcus (Sylvian fissure) is a very deep fold seen on the lateral surface of the hemisphere running in an anterior to posterior direction and serves to separate the temporal lobe from the frontal and parietal lobes. On the lateral surface of the temporal lobe are three gyri—the superior, middle, and inferior temporal gyri—which are separated by the superior and inferior temporal sulci. The primary auditory cortex is located on the superior surface of the superior temporal gyrus. The final lobe of the cerebral cortex is the insular lobe (island of Reil). It cannot be seen from a surface view of the brain because it is buried deep within the lateral sulcus. In the human brain, the insular cortex is circumscribed by the circular sulcus. The gustatory (taste) discrimination and visceral sensory cortex is located in the anterior part of this lobe. The "limbic lobe'' of the cerebral hemispheres consists of the cingulate gyrus, the parahippocampal gyrus, and the retrosplenial cortex. The limbic lobe is part of the limbic system, which also includes structures such as the amygdala and hippocampal formation (both in the temporal lobe), the mammillary bodies of the hypothalamus, and the anterior nucleus of the thalamus. The cingulate cortex can be seen on the medial surface of the brain, lying above the corpus callosum and beneath the cingulate sulcus. The parahippocampal gyrus can be found on the medial and inferior part of the temporal lobe bounded laterally by the collateral sulcus and the rhinal sulcus more at the anterior aspect. The lateral olfactory area, in which the fibers of the olfactory tract end, is found on the inferior surface of the cortex. This olfactory region includes the uncus, which is the part of the rostral medial parahippocampal gyus that hooks backwards; the entorhinal cortex, which is found in the anterior part of the parahippocampal cortex; and cortex in the region of the limen insulae in the anterior part of the insular cortex. The corticomedial nuclei of the amygdala also receive olfactory tract terminals and are considered to be part of the lateral olfactory area. 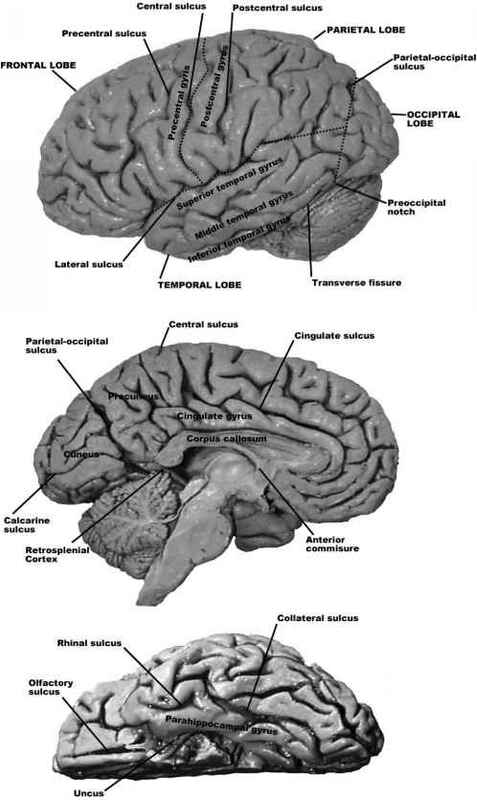 What parts of the cortex are demarcated by the longitudinal sulcus. ?